Genie Carriage Retro Fit Early Chainglide 35263R. * Genie garage door opener carriage inner slide. 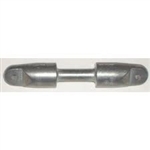 * Direct replacement for Genie Chain Glide openers with standard rail assembly. * Replaces 33048R and 20432R. * PCG400, PCG450, PCG600, and GCG350. 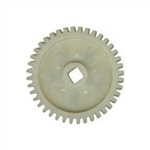 * This nylon gear is for use only in Genie PCG or Chain Glide models only. * For all ChainGlide models . 300-IC, 500-IC , IC-250 . This board has 6 terminals and will work as replacement for the 3 terminals board (20380R). Follow directions for removing additional punch-outs to make room for the 6 terminal board. As with all circuit boards, this item is not returnable. If unsure of what board you need, check sticker on relay box of existing circuit board for part number. Works with Genie Intellicode remotes, known also as Series II. This receiver replaces boards 31171R, 33629R, 36306R and is also known as a 34375R board. Genie is now sending the 36306R, which is smaller, but still compatible with the previous numbered boards mentioned. This board mounts inside the Genie motor head and is used on selective models with like receivers.